I enjoyed the course very much as it was very informative and hands-on. I learned a lot from this session. The main industries that provide employment in Zagreb are manufacturing, food and drink processing, chemicals, pharmaceuticals and textiles. This city is at the crossroads of trade routes leading to Central Europe, Mediterranean and South Eastern Europe. The CSD certification in Zagreb is ideal for all those IT professionals who want to be ahead in the learning curve. Join one such workshop on CSD training in Zagreb and get in-depth training in Scrum and Agile from certified tutors. The CSD course in Zagreb will have two parts. In the first part that will run for two days, participants will learn the basic principles of Scrum, its frameworks, roles and ceremonies. The second part of the Certified Scrum Developer training in Zagreb will run for three days and teach Scrum and allied principles with the aid of practicals, and real-life examples. Get course credits in the form of PDUs and SEUs depending upon your selection of the course duration. 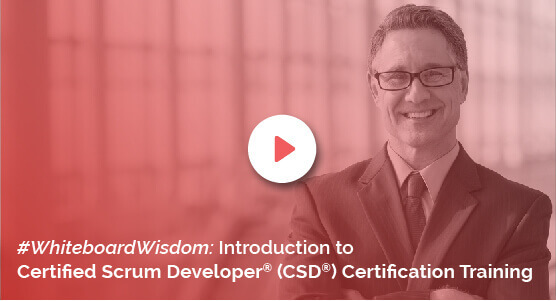 This five-day workshop on CSD certification will teach you the fundamentals of Scrum, and how to apply those principles in various situations. You will also learn best practices for setting up quality software, practising just-in-time techniques, avoiding overdesigning, and avoiding any potential obstacles in your path. Enroll in this course and learn how to support collaboration among many cross-functional teams, and also how to create software that promotes iterations easily. Knowledgehut is a silver training partner of Scaled Agile Inc (SAI), the institute has trained over 60,000 individuals all over the world. Get a two-year membership of the Scrum Alliance network by successfully completing the Certified Scrum Developer certification in Zagreb. Coaching and course curriculum by Knowledgehut is customized to suit the needs of working professionals and students alike.